The Interfaith Alliance of Colorado gives a voice to Coloradans who want to put their faith into action as a force for good in public life. We welcome anyone who would like to join us. The Interfaith Alliance of Colorado promotes justice, religious liberty and interfaith understanding through building relationships in order to educate, advocate, and catalyze social change. At The Interfaith Alliance of Colorado, we bring people together from our many religions and backgrounds to assure rights, inclusion, equity, and opportunity for all. Our work is focused in religious liberty (assuring freedom and equity for all), racial justice, and economic justice. Through educational forums, direct advocacy, and supporting creative and transformative change in our communities we work to be a force for good. We believe freedom of religion is part of the fabric of who we are. We must assure religion is used to support and not to harm. We work to assure GLBTQ rights & equality, reproductive rights health and justice, and the separation of church & state. Embracing a racial justice lens, we are committed organizationally and through our education and advocacy to dismantle racism that is deeply embedded in our psyches and our systems. We do this through continual training, reflection, and advocacy. In collaboration with community partners, we advocate for creative solutions to end homelessness, and to stop predatory lending practices. We envision a society where all people are free and supported to live the life they wish for. We imagine faith communities from many traditions and backgrounds who are committed to work grounded in our shared values, in order to engage in collaborative action to dismantle systemic oppression. We see people coming together across our many differences to build authentic, ‘got your back’ friendships, to celebrate together in moments of joy, to grieve together in times of pain, and to advocate and work together to improve people’s lives. We provide regular opportunities to connect, learn, grow, and act for rights and equality. Join us at one of our regular gatherings, or at rallies, vigils, or education programs that are held to respond to current community needs. 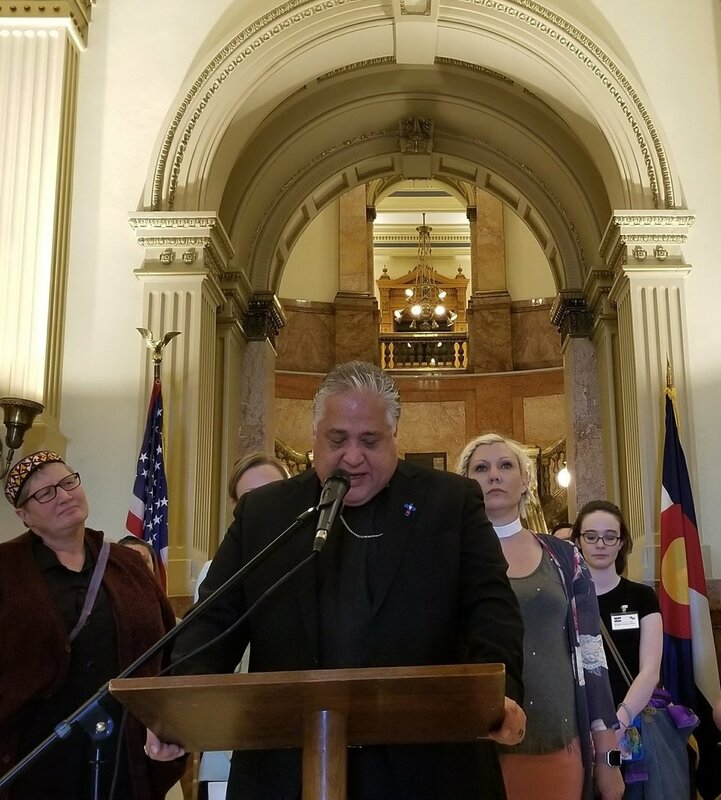 The Interfaith Alliance of Colorado develops and shares information and tools to support informed, educated, empowered progressive people of multiple faiths to be active participants in civic life. The Interfaith Alliance of Colorado is known as proactively present, respected, and influential in state and local politics. We increase our influence by educating, involving and empowering as many people as possible in faith based advocacy to disrupt systemic oppression and drive social change. Through forming partnerships between grassroots movements, advocacy organizations, faith communities, and traditional power holders we are able to embark on bold, creative and transformative projects to catalyze social change. Interfaith Alliance of Colorado values civil and religious liberty, human rights and equality, and moral government working for the common good of all people. Together, individuals, congregations, and community groups, are powerful allies in shared work to advocate for human rights, equality, and opportunity for all. Join us today to be a force for good! Regular gatherings of the Progressive Congregation Network, or Healing Our Divides provide space for connection and learning. Additionally, programs are held to assure you can keep current on today’s most pressing issues in the fight for rights and equality for all. Be an interfaith voice for rights and equality through supporting in big or small ways. Track legislation, make phone calls, or provide support at programs and events. Help us promote values of dignity, equality, and opportunity by making a donation today. Every dollar given directly impacts the movement for human rights and equality and opportunity for all in Colorado.